WOW Beauty Salon is a one place for all your beauty needs. With different Beauty Services; best standards in Cleanliness and Sanitization, best service techniques; WOW Beauty Salon could draw an edge in the Beauty Market. Our services include but not limited to Nail Therapy, Manicure & Pedicure, Hair Treatment, sculpture Cut, Shaping and styling, Hair Coloring, Skin treatment and therapy, all performed by an expert and friendly teams. WOW Beauty Salon exists in Dubai Mall. 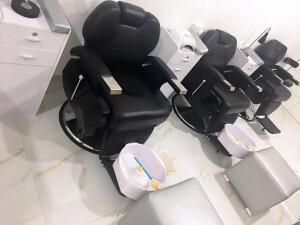 Since 2008, WOW Beauty Salon started in promoting a salon which is different from any other salon in terms of professionalism, hygiene, cleanliness, setting uniqueness, latest equipment, highly quality products and services. At Wow beauty Salon, we have some of the brightest salon professionals in the business working with us to help give us a better understanding of trends of beauty , techniques and high quality products for your total satisfaction you deserved to have. WOW Beauty Salon is a place to relief all your beauty worries. It is the place for you to relax and get a beauty transformation you’ve never witnessed before within a hygienic and clean ambiance. When visiting our Salons you will come out with the full expectation that will keep you always coming back. WOW!!! Let people say it…just because you deserve it. Our teams are waiting for you with high end products and experienced artists. To provide a memorable pleasant experience to our valuable clients. To preserve a Hygienic Clean and tidy atmosphere for them. To accomplish our vision and mission with passion, expert advice and the utmost professionalism and courtesy. To become the premier chain of salons in Dubai, then across UAE,and employer of choice in the beauty services. To ensure that our staff are always at the leading edge of the beauty industry. To provide our guests with superior services through our highly qualified staff, and the highest quality beauty products.